Why is Sukhbir Badal Silent on Mass Murders by Izhar Alam and Sumedh Saini? 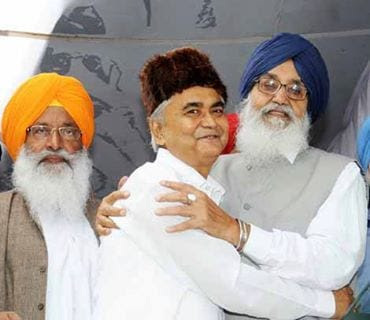 MALOUT, Punjab—In the “Kisan Khet Mazdoor Dhanwaad Rally” organized at Malout on July 11, the Shiromani Akali Dal president Sukhbir Badal asked the Indian Prime Minister Narendra Modi to punish the key perpetrators of 1984 Sikh genocide, namely Jagdish Tytler and Sajjan Kumar. Notably, the duo culprits have not been sentenced even after 34 years of committing genocide of Sikhs in November 1984. Meanwhile, Sukhbir Badal and senior Akali Dal leaders have continued to remain silent on their relations with Izhar Alam, who enjoys close proximity with the Akalis. Izhar Alam was the architect of the infamous “Alam Sena” which staged mass murders of Sikh youth disguised as encounters in the 1990s. “With regard to former Senior Superintendent Punjab Police (Jalandhar) Mohammad Izhar Alam, we can confirm that he now holds the position of Additional Director General (Administration) Punjab Police, a senior police posting. During the insurgency, he assembled a large, personal paramilitary force of approximately 150 men known as the “Black Cats” or “Alam Sena” (“Alam’s Army”) that included cashiered police officers and rehabilitated Sikh terrorists. Izhar Alam acted as KP Gill’s right hand man when he used extrajudicial methods to eliminated Sikh freedom fighters, along with carrying murders of tens of thousands of Sikhs in Punjab. Badals have continued to also use services of guilty police officials such as Sumedh Saini and Suresh Aurora who too played a big role in mass murders of Sikhs.